Luang Prabang is considered the jewel of Indochina, and is a designated UNESCO World Heritage Site. This culturally chic regal city is surrounded by mountains and was formerly the capital of a kingdom by the same name and was then ruled by French colonialists in the 18th century. With the delicate scent of frangipani sweetening the air, today boasts a mixture of ancient red-roofed Buddhist temples and French colonial buildings that house guesthouses, street markets and antique shops. The saffron- clad monks that inhabit Luang Prabang, particularly during morning alms-giving ceremonies, create a colorful sight to an otherwise calm and alluring urban environment. Amantaka, belonging to the world famous Aman Resorts, is housed on a large garden estate a stroll away from the temples, the Palace, the boutiques, bakeries and restaurants of Luang Prabang. La R�sidence Phou Vao, set on 3 hectares surrounded with lush gardens, offers breathtaking views of the mountains and the town of Luang Prabang. Set in a secluded green ambience, Le Sen Boutique Hotel exudes a peaceful and harmonious atmosphere within proximity to the city's myriad attractions and landmarks. A melting pot of old-world cultures fused with medieval royalty, Maison Souvannaphoum Hotel is the historic residence of the Prince of Laos. Just a short amble from the old town, Satri House is a striking, refurbished property that once was the childhood home of the 'Red Prince'- Prince Souphanouvong. Housed in a fort, Sofitel Luang Prabang is nestled in a heritage residential quarter, five minutes away from the city center. A century-old French colonial-style building, it features striking white-washed exteriors and influences of Lao architecture. Starting about 0800hrs, drive south to Vang Vieng along a twisty yet scenic mountainous route providing picture-perfect captures. First stop is at Houi Hei, offering panoramas of the surrounding mountains. Next up, explore Ban Kiu Kam Pone, a Khmu village. Then, arrive in Phou Phueng Fa to enjoy some of the best views in Laos (weather permitting), followed by a lunch stop at a café. Post lunch, visit Ban Hin Ngon, a picturesque Hmong village. Optionally, you can stop at Koe Kuang, boasting a local forest market offering edible snakes, rats and assorted reptiles – if you can stomach it! The day ends with a brief photo stop of the stunning limestone karst scenery at Phatang Mountain view point. Arrive in Vang Vieng by late afternoon, relax the rest of the day, overnight stay at hotel. Drift into a state of bliss as a silky fusion of green tea, white clay and aromatic oils is massaged into your body. A wrap then gently bathes your skin in active rosewood, rekindling inner youthfulness and helping to counteract free radicals. A soothing head massage completes this magical experience. Explore all that Vang Vieng has on offer with a 2D/1N trip from Luang Prabang to Vientiane via Vang Vieng. ========================================================================================= Day 1 (Luang Prabang-Vang Vieng): Starting about 0800hrs, drive south to Vang Vieng along a twisty yet scenic mountainous route providing picture-perfect captures. First stop is at Houi Hei, offering panoramas of the surrounding mountains. Next up, explore Ban Kiu Kam Pone, a Khmu village. Then, arrive in Phou Phueng Fa to enjoy some of the best views in Laos (weather permitting), followed by a lunch stop at a café. Post lunch, visit Ban Hin Ngon, a picturesque Hmong village. Optionally, you can stop at Koe Kuang, boasting a local forest market offering edible snakes, rats and assorted reptiles – if you can stomach it! 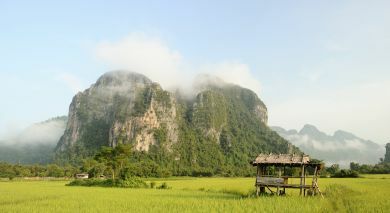 The day ends with a brief photo stop of the stunning limestone karst scenery at Phatang Mountain view point. Arrive in Vang Vieng by late afternoon, relax the rest of the day, overnight stay at hotel. ================ Day 2 (Vang Vieng-Vientiane): Today, visit Tham Jang cave and enjoy panoramic views of Nam Song River and the surrounding karst scenery. Set forth to Vientiane, stopping en route at Tha Heua, a small village specializing in dried fish, seen hanging in front of the houses. Continue to picturesque Nam Ngum, followed by lunch overlooking a lake. Next, stop at the famous Ban Keun salt mine and get an insight into the daily working life of the locals. The final stop is at Don Makai Market – an insect market, just outside of Vientiane, makes for an interesting experience for the more adventurous who are willing to try the ‘snacks’ on offer! Arrive in Vientiane by early evening. Enjoy a cycling and boat tour taking you to rarely visited villages, temples and a waterfall, all located across the Mekong River from Luang Prabang. Get fetched from your hotel in the morning and reach the boat pier. Board a private boat for a short cruise to the ancient royal temple of Wat Long Khoun, formerly used by past kings and queens for meditation purposes. Then, put the pedal-to-the-metal and cycle for about 30 minutes to reach Xienmene village. Explore this quiet village and visit the local school. Continue cycling along quiet unpaved roads via an unspolit Hmong Village to the little visited but beautiful Hoy Khua Waterfall. Stop to enjoy a picnic lunch. Cycle on to the riverside village of Ban Pak Leuang and re-board the boat. Follow the Mekong upstream to the village of Ban Chan, famous for pottery making. 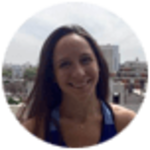 Meet locals and learn about their lifestyle. Continue by private boat back to Luang Prabang, reaching by about 1600hrs. Be fetched by your guide by 0800-0830hrs from your hotel in Luang Prabang. Travel by VIP minibus to the ‘Shangri-Lao Explorer Camp’, 15kms outside Luang Prabang. Take an introductory camp tour and learn all about the elephants from your guide. Enjoy feeding the elephants, relax by the riverside and have a chat with the hospital veterinarian. Venture on an elephant ride/expedition across the river traversing 1.5 hours via teak forests, jungles and over hills to reach the protected Huay Sae Valley. En route stop to view the amazing Nam Khan River Valley. At Huay Sae Valley, leave the elephant and rest at the jungle Sala. Enjoy a traditional Lao lunch near a secluded waterfall. Refresh and swim in the natural pools – depending on water levels. Continue with a 1.5 hour trek along the Huay Sae mountain stream, where the trail crosses bamboo bridges and passes waterfalls, unusual limestone formations and turquoise blue pools in the dense jungle. Where the trail leaves the valley, traditional horses from the Hmong hill tribes await to carry your bags up a demanding up-hill section. These strong little ‘porter’ horses accompany you for the last 30 minutes of the trek via fields, plantations and teak forests. Enjoy marvelous mountain views as your guide explains local agriculture and farming methods. Down at Nam Khan River, a luxury bamboo raft takes you back. Sip coffee, relax and observe traditional village life of farmers and fishermen. Float slowly down river for 1.5 hours, with an optional 30 minute stop at Tad Sae Waterfall. Return to the camp and leave by 1630-1700hrs by VIP minibus, heading back to Luang Prabang to your hotel. 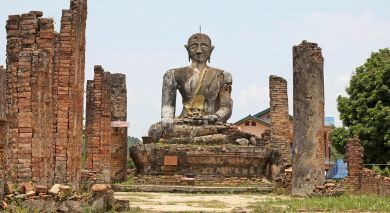 Embark on a 2hr cruise in a long-tail boat on the Mekong River; visit Pak Ou Caves. En route, see typical Laotian villages hidden amid thick foliage, wooden canoes bobbing by the shore, while floats mark the location of nets and fish traps. Explore Pak Ou’s 2 large caves – both housing thousands of Buddha images ranging from a few centimeters to 2 meters. At Ban Muang Keo village observe local weavers and whisky distillers honouring their timeworn traditional crafts. Today, experience the Baci ceremony (a mix of Animism and Buddhism) in a local home…a traditional Lao ceremony organized to keep the good spirits inside of everyone and to celebrate a special event, whether a marriage, a homecoming, a welcome, a birth, an annual festival or to wish someone good luck on the journey ahead. It involves the tying of white string around the wrists. It can take place any day of the week and all year long, preferably before noon or before sunset. The more commonly used term is ‘su kwan’, meaning ‘calling of the soul’. After breakfast, board a private long-tail boat for a two hour upstream cruise on the Mekong River, enjoying tranquil countryside vistas and wooden canoes bobbing by the shore. Along the way, stop first at Ban Muang Keo village and take a short trek to the mysterious Pak Ou Caves. Explore Pak Ou’s two large caves set on a limestone cliff facing the Mekong River and housing thousands of Buddha images – from a few centimeters to two meters in size. Return again by boat, stopping en route at Ban Nongxai, an artisans village. Arrive back in Luang Prabang in time for lunch. 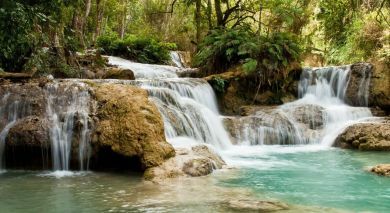 In the afternoon, drive out to the beautiful Kuang Si Waterfalls. Take a refreshing dip in the cool waters of the turquoise pool or simply stroll along the forest trails. Nearby the falls, visit a Bear Rescue Center which does a great job of protecting and rehabilitating the rare Asiatic Black Bear. Return to Luang Prabang by late evening. This morning, transfer to Tamarind Restaurant..a picturesque garden restaurant..for a cooking demonstration. Visit the local market by tuk-tuk with the chef, who will teach you about the various raw ingredients required for use in the Lao dishes that you will be preparing. Back at the restaurant..set around a lily and lotus pond with towering palm, tamarind and mango trees..learn how to prepare and cook a Lao meal under the expert tuition of your chef. The class ends with lunch comprising all the dishes that you learned to cook in class. A recipe book is made available to take home. Transfer by car to the Living Lands Organic Farm. Here, meet up with a local farming guide, where you will be invited to interact and experience step-by-step the rice harvesting operation; see also how different tools are created. End with a tasting of traditional foods using rice. You will leave with a new appreciation for rice, and an admiration for the Lao people who yet continue to harvest rice without modern machinery. Return to your hotel by mid-day.